Welcome aboard! 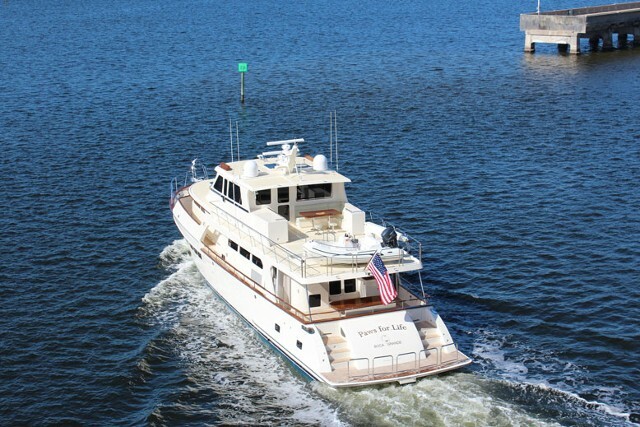 The large aft deck is your point of entry where your life-style guides the options for outdoor living and entertaining. Hidden grills, settee's with a table or a chaise lounge can be built in for comfort and function while maintaining the beauty of the open space. 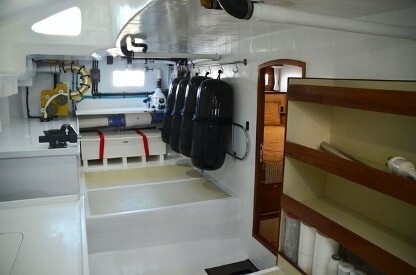 Leaving the aft deck, entry into the saloon presents a long unobstructed view all the way into the pilothouse. The woodworking, as on all Marlow Explorers, is impeccable with grain matched veneers throughout achieved by the use of one single log to supply the veneers for the entire yacht. The immense expanse of saloon sole is a continuous run with no cross seams anywhere. With a minimum of ten coats of varnish, the interiors glow with a warmth that is luxurious and inviting. Regardless of the layout, there are features that are constant and consistent in all of our models - flawless joiner work, fully finished Formica lined storage areas, dovetailed drawers and high quality hardware. 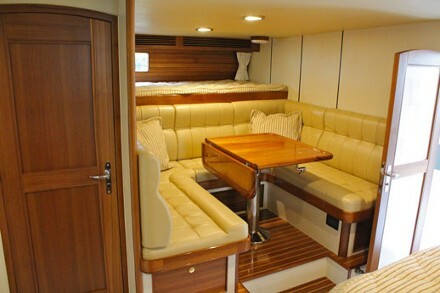 The built in sofa with storage and coffee table are on the port side facing two occaisonal chairs flanking their own coffee table on the starboard side. Additional features include a wine locker, entertainment center with wet bar and icemaker, TV cabinet with pneumatic lifts for invisible stowage and lovely bent wood signature overhead handrails. 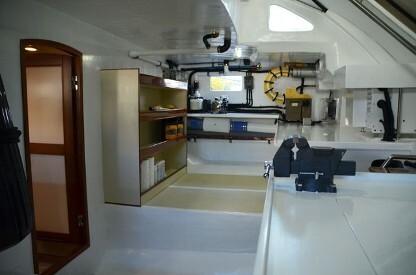 Three steps up to the pilothouse will bring you to the galley that is airy, well-equipped and inviting. There is a large expanse of granite or Corian counter space due to the under counter Sub-zero refrigeration, Fisher-Paykel dishwasher drawer, and smooth glass cooktop. 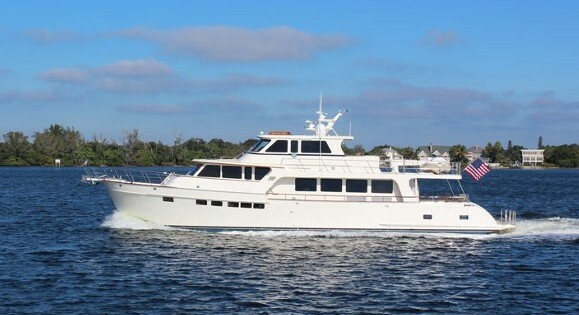 While at work in the galley, one need not feel left out of the action since forward you can view out windows 360 degrees or aft, converse with guests in the saloon due to the open construction of the yacht. 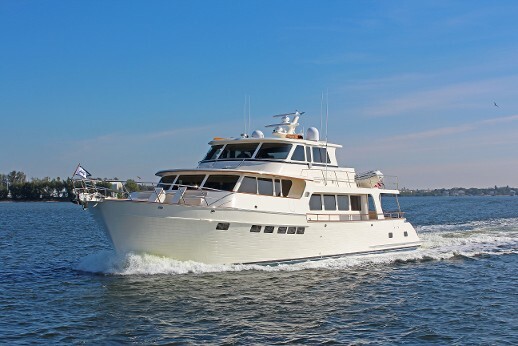 A forward settee nestled under the windshield can easily seat eight with a wonderful view out of the pilothouse windows. The helm in flybridge models, which can be centerline or not, faces a beautiful teak console with a full array of instruments, gauges and information panels. In Command Bridge models, the unneccessary lower helm opens the area for a large seating plan and galley. A curved teak stairway leads to the accommodations deck where either three or four staterooms are found. The spacious master stateroom features a centerline king-sized bed flanked with twin night stands, a choice of bureaus, a mirrored vanity, cedar-lined hanging lockers or bookcases in any combination. The his and hers heads share a generous shower with optional tub. All bath hardware is Grohe Infinity, the sinks are china or optional onyx and the counters are in a choice of granite, marble or Corian. The forward VIP has a king berth, vanity, flat screen TV and ample storage, plus a private head with sink, toilet and glass stall shower. 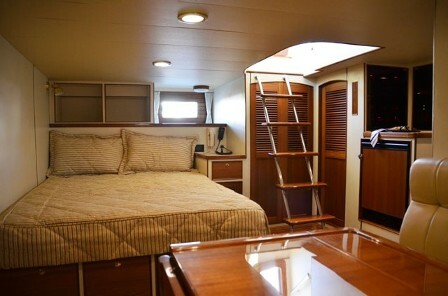 The port side guest stateroom offers twin beds, a cedar-lined hanging locker and private head with stall shower. There is a starboard side stateroom features a bunk with a laundry center concealed under it, perfect for a grandchild to stow away in! The option for a walk-in pantry is also available. 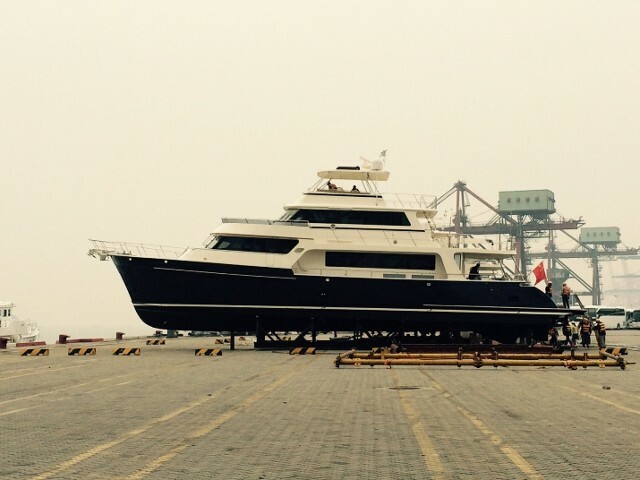 The new layout and shape of the lazarette and Crew quarters provide large areas for storage of all your toys and gear; a workshop and bench; crew quarters that most 120' yachts would envy. There is a queen bunk, a u-shaped sette with a table, microwave, refrige and icemaker, TV and full stand-up head and shower. 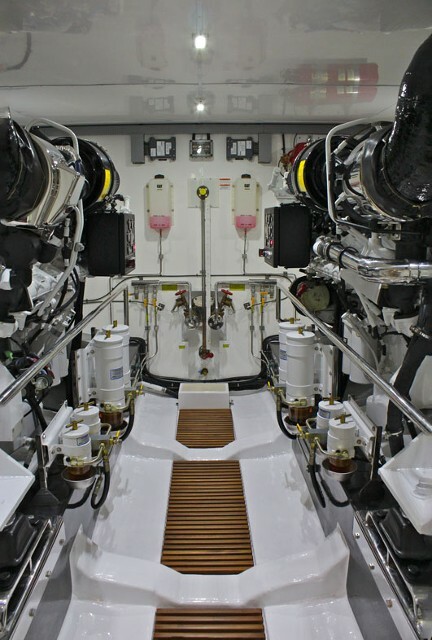 Access to the pristine engine room is through a water tight door and once inside the engine room full stand-up head room allows for ease in engine maintenance.